10 X 10 Booth - $80 (Dlls) includes canopy, 1 table, 1 chair and electricity. No partial payments are permitted. All vendors are required to read and adhere to the Participant Rules (Spanish) pertaining to the event. Your payment of the entry fee constitutes your agreement to be strictly bound by the Baja Blues Fest Participant Rules and any vendor not adhering to the rules will be dismissed from the event. 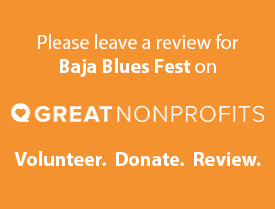 Email: admin@bajabluesfest.org for the space available.